Another year has passed, one day at a time. Each of those days, the KNOM signal has been filled with inspiration, education, information, prayer, discussion of important issues, news, music, entertainment and companionship. Each of those days was the product of hard work by each person on the KNOM staff. Some of those days were smooth, but many were difficult and trying, involving long, intense hours. 2002 will be remembered as the most award-winning year for our mission, ever. We joyfully share those honors with you. Your financial support and your prayers are the backbone of the KNOM mission. Thank you for your role in KNOM�s continued success, as we work together to bring God�s Love to this vast region. GOLD! 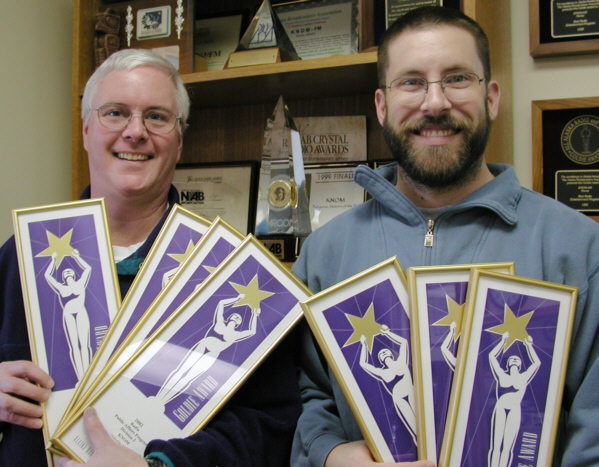 (left) KNOM general manager Tom Busch and production director Mike Nurse display the seven Alaska Broadcasters Association �Goldie� Awards which KNOM received in November. And...in December, we learned that our mission has just won two Communicator Crystal Awards. We are humbled and thankful. GIVING YOU THE SLIP: As you�ve noticed, we�ve included a coupon this mailing, for the first time in the 36-year history of the �Nome Static,� and we offer you the option of contributing by credit card. This is in response to many, many requests. Please let us know what you think. Please consider adding missions like KNOM to your will. For many, it is the largest gift they will ever make. We prayerfully place all bequests into designated accounts that will be used only for major capital improvements or to protect the mission during future emergencies. INSPIRATIONAL SPOT: The miracles of nature don�t seem like miracles because they�re so much a part of our everyday living. If no one had ever seen a flower, a weed in bloom would be breathtaking. As you can see from our income graph (top left), the overwhelming share of KNOM�s operating income is individual gifts from good people like you. In our most recent year, KNOM�s cash expenses were $843,375. This does not include an estimated $130,000 gift from the KNOM staff, all of whom work for less than equivalent salaries elsewhere. 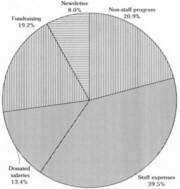 This gift by KNOM employees, however, is indicated as �donated salaries� on the expense graph (lower left). 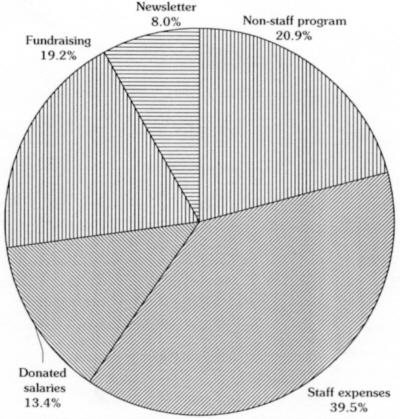 For FY2002, our fundraising expenses were unusually high. This is because our major fundraising efforts for last year went into the mail just ahead of September 11th. As you can imagine, that was a difficult period to find new contributors. And so, we duplicated our effort in the spring, when the climate for fundraising was more agreeable. As we have pledged to you, we are deeply appreciative of your generosity. We understand that you sacrifice to make our mission possible, and we do our utmost to exercise good stewardship. For one thing, the construction of our new buildings in 1991 and 1992 saves our mission about $85,000 every year in reduced maintenance, electric and fuel costs. Still, we live and work in a remote outpost, un-connected to the outside world, where the cost of living and operating is about 200% that in the Lower 48 (or even urban Alaska!). 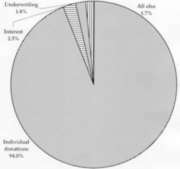 For example, as we�ve noted before, the cost of a gallon of milk is $6.60. Orange juice is about $8.00 a carton. KNOM follows the precepts of stewardship and accountability as stated by the National Catholic Development Conference. We promise to use our resources responsibly and engage in sound and ethical business practices. We also adhere to a strict written policy, under which all staff are taught how to avoid sexual misconduct, and to report it, should it occur. If you would like a copy of FY2002�s financial statement, or have any questions at all about KNOM�s operation, please drop general manager Tom Busch a line and he will be happy to respond. Thank you again for making our mission�s important work possible. We are the oldest Catholic radio station in the United States, and our signal beams loud and clear into thousands of homes in isolated village Alaska because of you. INSPIRATIONAL SPOT: My life. How short it is. So short that there is not one day or one hour to waste. (left) Volunteers Tim Bodony and Andrew McDonnell fly to White Mountain to document the revival of Eskimo dancing there, the first traditional dancing in seventy years. February 5: As he does every morning, engineer Les Brown walks the final 400 feet to the transmitter site through deep snow, unaware that residents of a nearby cabin had spotted a polar bear prowling overnight. Meanwhile, the Alaska Broadcasters Association sends its secretary-treasurer, KNOM program director Ric Schmidt, on lobbying trips to Juneau and to Washington, DC. March: KNOM airs the St. Francis Xavier Novena of Grace, produced by Lynette Schmidt with material assembled and recorded by village pastor Fr. Tom Provinsal, SJ. Also in March, �Two Brothers,� one episode of Mike Nurse�s �Eskimo Stories and Legends,� wins a Silver Angel Award. The village of Gambell is 200 miles west of Nome, only 35 miles from Russia. You hear KNOM in its 153 homes all day. And so, volunteers Andrew McDonnell and Ryan Conarro fly to the village to cover its annual spring festival. April: Fr. Paul Macke, SJ flies to Nome to conduct a retreat for our five volunteers. The spiritual exercise ends with a Mass attended by all the staff. April 26th: high winds snap one of the unipole wires on KNOM�s antenna, forcing the station down to 60% power. May: Late spring brings weeks of dense fog, sleet, snow, heavy rain, high winds and freezing drizzle. One weary traveler reaches Nome after checking in for three flights that were canceled, and four more that circled Nome and turned back. The journey from Anchorage took four weary days. May 15: The weather has quieted, and tower climber Barney Griffiths (left, with KNOM engineer Les Brown on the transmitter building porch) restrings the unipole cable on the tower, bringing KNOM back to full power. 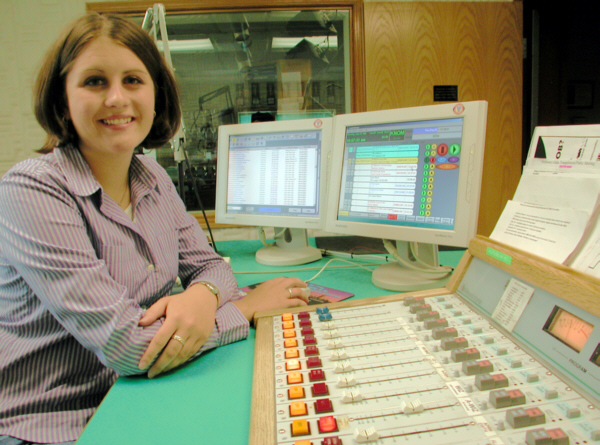 June 13: After seven days of training, new KNOM volunteer Amy Flaherty (left) successfully announces the KNOM morning show for the first time, on her 22nd birthday. July: Volunteer Julia Arrotti (below, left) flies to Toronto to cover World Youth Day for KNOM listeners. 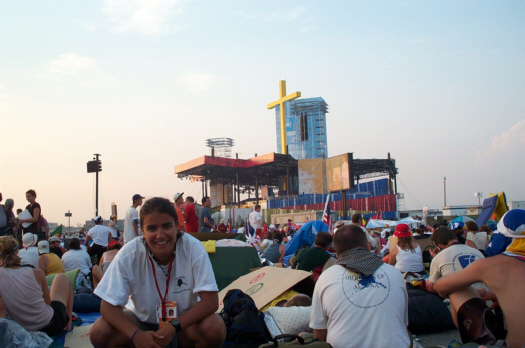 �Seeing and hearing the Pope in person was a deeply emotional experience,� she says. August 13 brings the first frost of the winter season to Nome. August 22: From Fairbanks, 520 road-less miles from Nome, KNOM broadcasts the ordination of Bishop Donald Kettler, thanks to help from Fairbanks station KIAK and former KNOM�er Peter Van Nort. KNOM spiritual director Fr. Mark Hoelsken, SJ narrates the broadcast. (left) Fr. 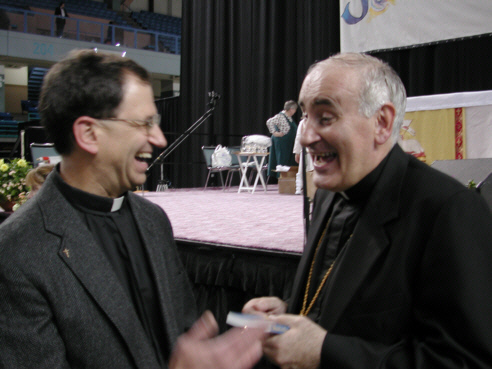 Mark and Bishop Kettler share a laugh following the ordination. September: KNOM staff begin attending volunteer recruiting fairs at Catholic colleges in the �Lower 48.� Former volunteers Michael Warren, Julia Arrotti, John Hall, Andy Digiovanni and Tim Bodony pitch in, and KNOM winds up visiting twelve campuses. October 19: General manager Tom Busch accepts the Gabriel �Radio Station of the Year� Award at a ceremony in Burbank, California. It�s the tenth time that KNOM has received the top radio Gabriel. Among the audience of 500 is a cheering section of 22 KNOM staff, contributors, families and friends. Sometime in October, KNOM broadcasts its 1,000,000th inspirational spot since signing on the air in July 1971. 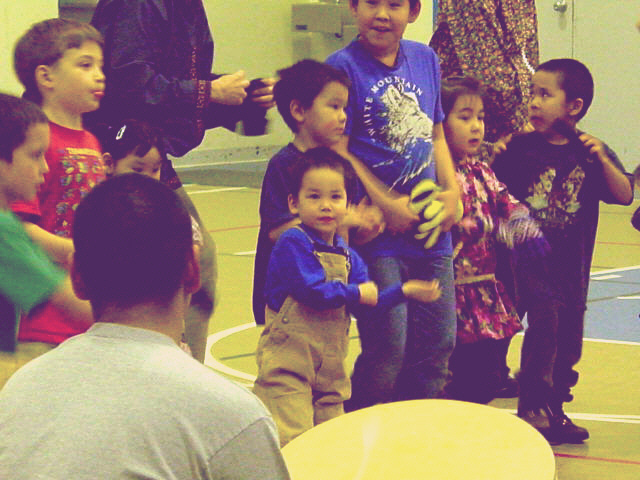 November: KNOM inaugurates audio on its website, www.knom.org/realaudio, including a 15-minute sample of programming, plus Eskimo music, inspirational spots and �KNOM Profile� interview programs. The Alaska Broadcasters Association honors the station with seven awards. 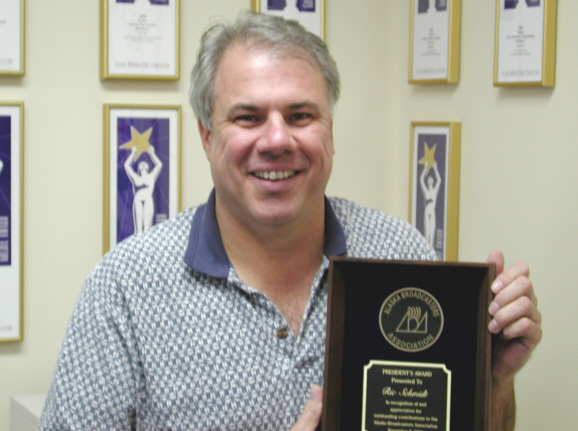 Program director Ric Schmidt (left) is given the President�s Award for service to the state�s broadcast industry. Since January, KNOM has broadcast 34,000 inspirational and 34,000 educational spots. While awards dominated KNOM�s headlines, the real story of our mission is its service, 24 hours a day, thanks to full time volunteers, minimally-paid salaried staff, and you. We sincerely thank you for your wonderful help. You remain in our prayers. May the New Year bring you and those you love many of God�s blessings. God bless you!